Love running and exploring new destinations? Try running in South Africa for a fresh way of discovering the nature and urban cityscapes the country offers. You really get the best of both worlds by combining your running addiction with your sightseeing fervour. 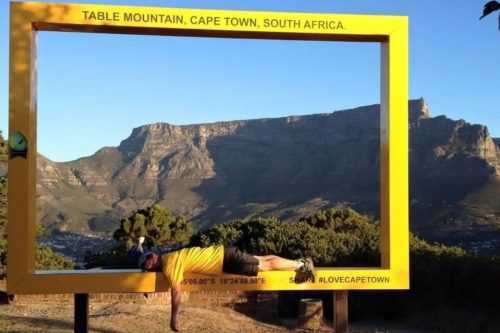 Our guided runs in South Africa show you some of the country’s most incredible sights. For example, city runs that take you through the history of Cape Town, trail running on Table Mountain and everything in between. So whatever kind of runner you are, we’ve got the route for you. Pack your trainers, lace up and let’s go running in South Africa. You won’t just explore the country while feeding your passion, but you get a personal, local running guide too. Staggering natural landscapes are one of the main reasons travellers visit South Africa. The sand dunes of the Kalahari, Table Mountain and Cape Point sum up the country’s imposing countryside. Running in South Africa often means hitting the coastal trails too, which vary between craggy cliffs and pristine beaches. However, don’t spend too much time in the water, as the Indian Ocean is famously home to the odd great white shark. Incredible wildlife also spreads inland, especially in Kruger and Kgalagadi parks. In South Africa, take a safari tour and see the Big Five animals — lion, elephant, rhino, buffalo and leopard. In these vast, open, low-light areas, you can also lie back and take in some southern-hemisphere stargazing. South Africa’s history has made it an incredibly culturally diverse country today. From tribes to Dutch rule, British Rule, Apartheid and the Mandela era, the word turbulent just doesn’t do it justice. The silver lining is that now there is a wealth of diversity, with 11 official languages and at least 35 languages spoken in day-to-day life. If you simply can’t get enough of running in South Africa, why not challenge yourself with a race? The list of marathons, ultramarathons, fun runs, trail running races and more is almost endless. So if you have a real passion for running, it makes sense to have a trip that encompasses a race and a South African running tour. What are you waiting for? Pack those trainers, meet your local guide and let’s go running in South Africa.